Here in Sheffield those of us who are not cycling freaks are more or less housebound for the day! The huge invasion of Yorkshire by the great unwashed French began yesterday and their advance south reaches us today! This large bunch of cycle nutters has shut down most of the city and travel is near on impossible for 12 hours from 7:30 am. Luckily I am not on-call at work and don't need to be resident for 12 hours and therefore I have lots of time to write a post for you. Although "SHE" says that she has some DIY for me to do later - time to install a new roller blind in a bedroom. No rest for the wicked! There seems to be a trend for "Me too" posts amongst us puzzle bloggers - My review of Wil's egg puzzle was improved upon by Jerry first and then Allard and now it's my turn to review something shortly after someone else has published. The theme here seems to be that when something truly special comes out which may be only available for a limited time, we rush to get that information to you as fast as possible - I call it my civic duty! The Popplock T9 is very limited in number and nearly sold out - if you do want one for your collection then the usual suppliers are Grand illusions, Puzzle Master and Rainer himself. As far as I know only Puzzle Master have any left. 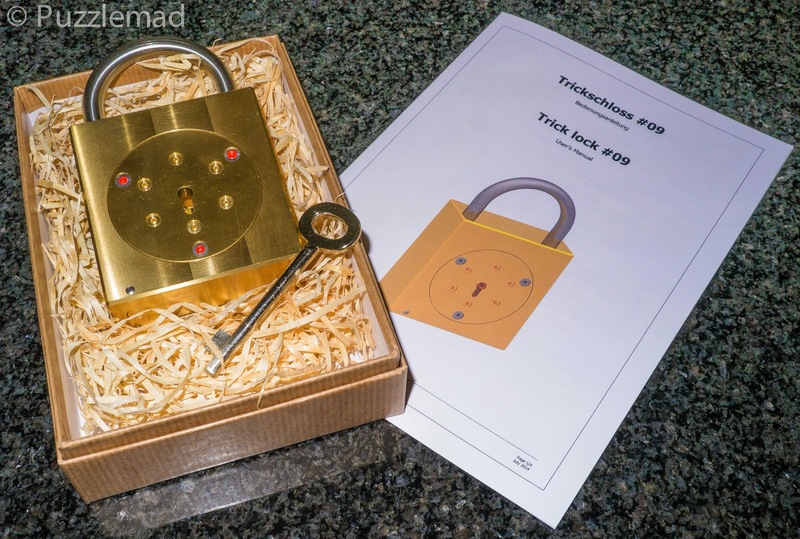 On 30th June I received an update email from Rainer Popp that his latest trick lock was about to be released and without even hesitating for a moment I shot off an email. Some time later a confirmation email was received and at that point I blinked and focussed abruptly on the price! 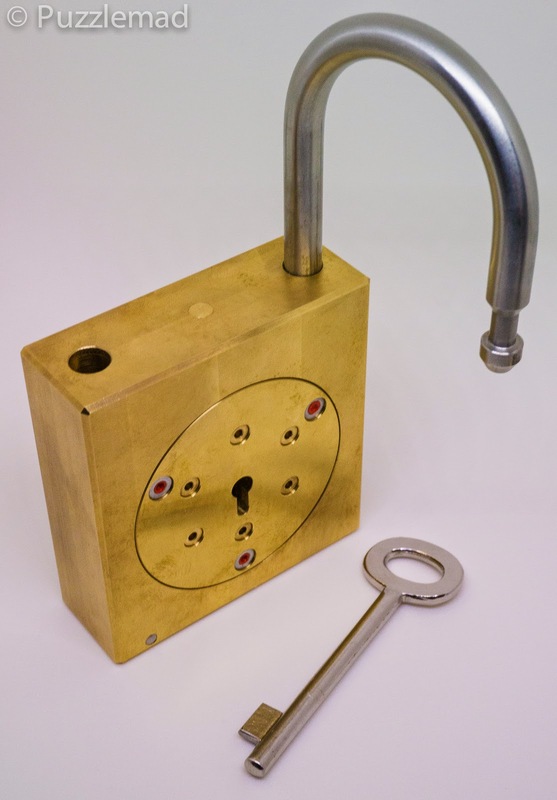 These are hand made metal locks of the very highest quality and you should be ready for the fact that they are going to cost a fair sum of money! BUT they are worth it! So far I have not told the present Mrs S how much, but she knows that it was a lot and my excuse (as always) is that "it's an investment and will be worth much more in a year or so". She seems to have caught on to this ploy and replied that I never sell anything though - I need another excuse now - all suggestions gratefully received via my Contact form. So having placed the order on 30th June, there was a big box waiting for me in the kitchen when I came home from work on Thursday 3rd July. Now that is fantastic service! I immediately knew who it was from by the huge amount of packing tape encircling the entire box. I set to with my trusty knife and inside was another box which, despite being quite small, was exceedingly heavy along with a little instruction booklet. I immediately put the instructions aside and took my photos. I was astonished to see that Allard had solved his copy already and even had his review published before I had even opened my package. After dinner, I had time to play - but first a little detail - it is 11.5 x 3 x 7.2 cm in size and weighs in at a gigantic 1050g (2.3lb). Whatever you do don't drop this puzzle - it will hurt you or smash/dent something badly! It is so heavy because it is practically a solid lump of brass and stainless steel - it absolutely screams quality workmanship at you. Tarnished by my fingers already! 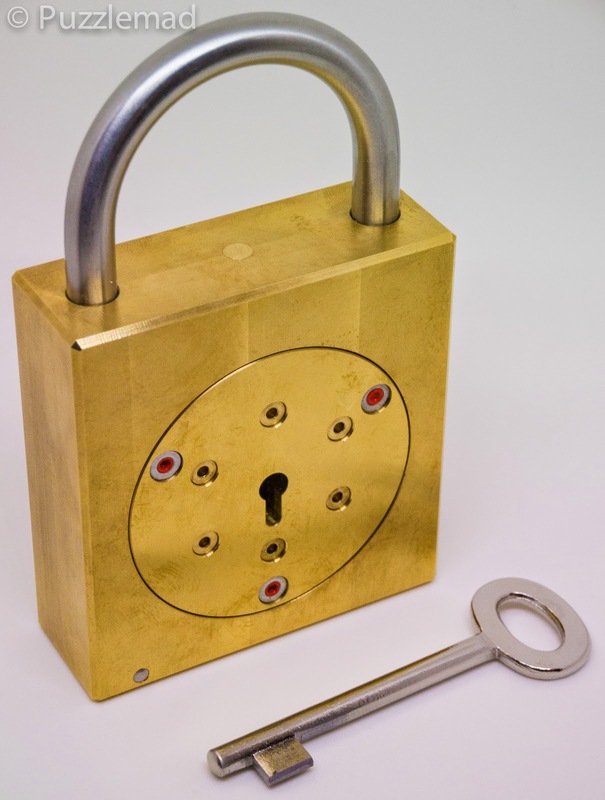 It consists of what looks like a standard padlock with a single keyhole and a very simple key. The front plate of the lock has 2 different types of rivets spaced around the keyhole. It is clear from previous locks that the rivets filled with the red wax/paint are there for the assembly and not to be interfered with but all the others are fair game if you can do anything to them. I am sure that absolutely everyone does the same thing - yes, you know it won't work, but you just have to put the key in the lock and turn it! Straight away there is a sort of Aha! but not particularly helpful - there are 2 levels inside very similar to the T6 (but not similar enough to be useful). At this point I was stuck randomly turning a key and poking the key at rivets - neither of which do very much! I put it down and watched some TV with my wife and kept picking it up every now and then. Suddenly a lightbulb went on above me and I tried something new. It didn't work! So as usual, I tried it again and again and again (because I'm not very bright) but this time it worked and suddenly I had more "information" to play with. I couldn't (and still can't) repeat that step every time but I think I understand why. This extra information allows much more investigation and now you start to understand why the face looks like it does and you start to experience how things inside and out interact. Even without a vision of what is actually inside you begin to build a picture. At this point there are lots of combinations of things to try - try something in a different place or a different order. Needless to say there are LOTS of possibilities but you don't need to be systematic! It is not a game of random chance and coming across the correct path by sheer dogged determination. This puzzle is solved by deduction. After about 20 minutes of investigation it is possible to formulate a distinct plan and suddenly you have a whole lot of pieces interacting as one. For me, I struggled with the 9th step! Things weren't happening as they had before and I was about to put it down again for a while when something utterly amazing happened! I was so surprised by it that I actually undid it to work out what had happened - it is a marvel of engineering! Make sure you do this step in very good light - it is very subtle! Not much of a clue, I know, but you will understand when it comes to that time! I was doing my puzzle in a dimly lit living room whilst watching TV with a fascinated cat on my lap preventing me moving towards any better lighting. That is my excuse for why this step took me nearly 2 hours! Examining the lock whilst doing "things" to it eventually showed me something new but it was so subtle that I had missed it entirely for hours! Even having found that new thing, it was not immediately obvious how to use it but eventually I tried something else special and BAM! I had this! As Allard stated "It's Awesome" - we are back to a true Popplock of amazing quality and puzzling standard. Puzzle Master have rated as a difficulty level 10 out of 10 (Mind Boggling) and I personally would rate it as a 9. A 10 should be limited to puzzles that take days or weeks to solve. It is expensive but in my, and others' who have solved it opinions, it is well worth the money. You should NOT need to resort to the instructions as it is a really nice puzzle to explore and fathom out over a few hours. Be prepared for rather sore thumbs when you are finally done! Jerry will review it in due course but he is being a very brave boy and picking his copy up in August at the International Puzzle Party - I don't know how he can stand to wait that long! Hopefully soon I will be able to review something that won't break the bank! Great review :-) Missed out on a purchase this time sadly but a great read. Wil and Rainer may have some left and still available from Puzzle Master (with huge postage cost!) You can play at an MPP when you come along. Great review and insights on the T9, Kevin. Yep... no "Me Too" review from me until after I get my copy at IPP... and even then it will probably be another two to three weeks later as I will be in the UK for another week and a half after IPP. We expect you to solve it during your travels and publish an on the road review! I knew you'd approve of that sound! It's almost my favourite part - after the sore thumb!